The weekend has zoomed on by so fast, I would love another day. 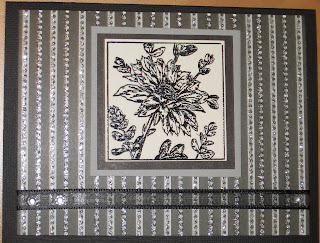 I made the this card/certifcate holder after I made the cardinal one for the same friend. She wanted something fun, I thought this monkey fit the purpose. I had a friend ask me to make her a card for a gift certificate for her mom. I though a certificate type holder card would work well. This was the result, I am kind of fond of it. I made good use of a glitter pen I found in one of the local Stamp stores, it did a nice job of putting a fine line around all my edges. Stamp: Ribber Stampede Cardinal, All Night Media Snowflake Cluster, Artful Stamper (unknown stamp name) Holly Ribbon? TGIF :) It has been a long week and I am looking forward to the weekend. I was looking for more pictures I had taken of the card swap cards but found this one first. This card was created for my husband for Valentine's day, the card is quite heavy as the XO are little metal pieces that I had found, the hearts are stickers. Happy Thanksgiving for those readers giving thanks today. The first book I purchased with cardmaking in mind was the Stampin' Up Idea Book and that started my stamp addiction, my husband laughs at my coloured tabs on every other page. When I first started making cards I started to notice more and more magazines and books for cardmaking. 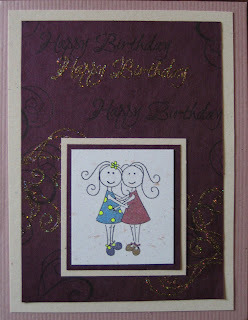 I don't know if they have always been around and I just did not notice them or if cardmaking has become more popular. Either way I was looking for inspiration and guidance anywhere I could find it. I started with the library and signed out every book on card making I could find and from there it has only escalated. When I discovered Cardmaker magazine it was love at first read and it was my very first card magazine subscription, I can't wait for every new release to arrive. That eventually led me to the cardswaps that are hosted on their website. I wanted to see what other cardmakers where making the only flaw with that grand idea was that I needed to send out cards too and I had a few concerns with that. The first concern being that I am still a little shy when it comes to my cards, I know I have things to learn and it would be people outside of family and friends who would be receiving the cards and I was concerned that when people received my cards they would be disappointed. The second was that I had a deadline that I needed to work within, doing Birthday and Christmas was one thing but to make and send a certain number in a preset time frame was totally different. To date I have done 3 card swaps and I am working on a Christmas Card exchange. Much to my surprise and delight there are a lot of card makers out there at my level and are pretty much in the same arena as I am. From my 3 cards swaps I received some beautiful cards with some amazing techniques. I can't wait to see the cards I will receive for the Christmas exchange. Being as I can't really show my Christmas cards (would not want to ruin the surprise) I think for the next couple of posts I will see if any of my pictures from my swaps are post worthy. Whew that was a little long winded. My first card swap was for flowers of the month, I picked November. I have to say, I never thought it would be difficult to find stamps of Chrysanthemums. I was wrong and I feel fortunate I found a large stamp that had a 4 different flowers on it. I apologize for picture quality of the card is not very good. Once the Christmas rush is done, I think I might consider another swap. Have a great day. Thank you everyone for the warm welcome to world of blogging. Thank you once again to my sister Barb who is hand holding me through this process. You would think with me being technically inclined I would get the hang of this, not a chance. I am sure with time that will change. I am going to try a card recipe today, I think I will keep it pretty simple so I don't provide the wrong information. This is a card I created for Halloween this year. I was not overly inspired for whatever reason at the time but I was pleased with what I ended up with. 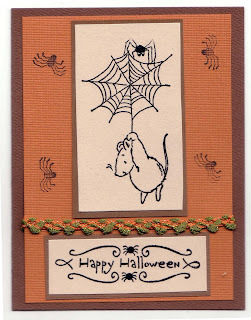 Stamps used: Penny Black-Scare in the air, Studio G-Happy Halloween, Stampin' Up!-Halloween Backgrounds. Cardstock: Brown, orange and cream cardstock (unknown company). Ok, so that really was not helpful was it. I will try better next time. I saw a sketch using a onsie on a card and I thought it was the cutiest thing. I think I did an ok job on this card. I am still working on the best way to take a photo or scan my cards, I am trying to recruit my husband for the job. Sorry no recipe for this card. Welcome to my humble attempt at blogging. My sister has been blogging successfully for a few years now and has convinced me that this might be a good way to create a journal of my journey in card making. I have been stamping for almost a year now, my card making skills are growing slowly and there are good cards and bad cards along the way. Stop by and say hello you just never know one day there might actually be something interesting to see. I can't say I will update daily and I know I can't accomplish a card a day but I wish do my darndest. The first few posting will not have card recipes attached, I have no idea what I was thinking when I made them and I definitely did not pay attention to what supplies I was using. 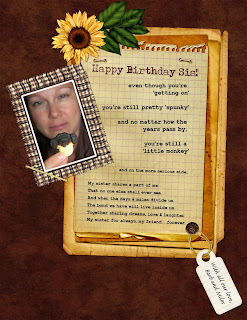 Thank you Barb, for putting together this blog for me and for the wonderful layout although the monkey picture I am sure will haunt me for a while. The very first card I am posting is the birthday card I made for my sweet sister :) She seemed to like it and it was fun to make. I am not much for glitter, but hey it can grow on you. Well this is not a card I made - this is a digital birthday card created by my sister.